In looking to completely revamp their web presence, Wimbledon Racquets and Fitness Club (WRFC) employed the expertise of Vitalatus. Vitalatus have just finished creating a visually striking site for global independent financial advisor, Lumina International. 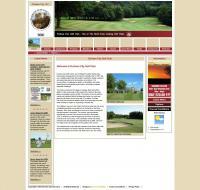 Vitalatus furthered its partnership with Robson Bell Media by creating a brand new site for Durham City Golf Club. Design experts Robson Bell Media were in the process of updating a website for one of their clients, JCM Environmental Services. All of this of course can be controlled by the club secretary using the simple user interface.